Welwel, is a town in eastern Ethiopia known as the Ogaden. Located in the Werder Zone of the Somali Region, this town has a longitude and latitude of 7°03′N45°24′E with an elevation of 570 meters above sea level. The Central Statistical Agency has not published an estimate for its 2005 population. The Kingdom of Italy was a state which existed from 1861—when King Victor Emmanuel II of Sardinia was proclaimed King of Italy—until 1946—when a constitutional referendum led civil discontent to abandon the monarchy and form the modern Italian Republic. The state was founded as a result of the unification of Italy under the influence of the Kingdom of Sardinia, which can be considered its legal predecessor state. The Italo–Ethiopian Treaty of 1928 stated that the border between Italian Somaliland and Ethiopia was twenty-one leagues from and parallel to the Benadir coast (approximately 118.3 km [73.5 mi]). In 1930, Italy built a fort at the Walwal oasis (also Welwel, Italian: Ual-Ual) in the Ogaden, well beyond the twenty-one league limit. The fort was in a boundary zone between the nations, which was not well defined; today it is about 130 km (81 mi) inside Ethiopia. 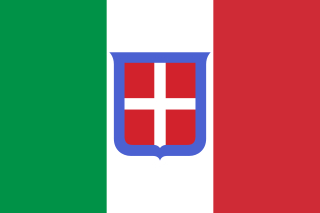 Italian Somaliland, sometimes also referred to as Italian Somalia, was a colony of the Kingdom of Italy in present-day northeastern, central and southern Somalia. Ruled in the 19th century by the Somali Majeerteen Sultanate and the Sultanate of Hobyo, the territory was later acquired in the 1880s by Italy through various treaties. Dubats was the designation given to armed irregular bands employed by the Italian "Royal Corps of Colonial Troops" in Italian Somaliland from 1924 to 1941. The word dubats was derived from a Somali phrase meaning "white turbans". British Somaliland, officially the British Somaliland Protectorate, was a British protectorate in present-day Somaliland. For much of its existence, the territory was bordered by Italian Somalia, French Somali Coast and Ethiopia. From 1940 to 1941, it was occupied by the Italians and was part of Italian East Africa. On 26 June 1960, British Somaliland declared independence as the State of Somaliland. On 1 July 1960, the State of Somaliland united, with the Trust Territory of Somalia to form the Somali Republic (Somalia). The government of Somaliland, a self-declared sovereign state that is internationally recognised as an autonomous region of Somalia, regards itself as the successor state to British Somaliland. Ethiopia never officially surrendered, and pleaded for help from foreign nations, such as Haile Selassie's 7 June 1936 address to League of Nations. As a result, there were six nations which did not recognize Italy's occupation in 1937: China, New Zealand, the Soviet Union, the Republic of Spain, Mexico and the United States. [ citation needed ] Italian control of Ethiopia was never total, due to continued guerrilla activity, which the British would later use to their advantage during World War II. However, by 1940 Italy was in complete control of three-quarters of the country. 1 2 Zapotoczny, Walter (2018). The Italian Army in North Africa: A Poor Fighting Force or Doomed by Circumstance. Oxford: Fonthill Media. ISBN 9781781556740. OCLC 1053859776. ↑ Domenico Quirico. Lo Squadrons Bianco. p. 267. ISBN 88-04-50691-1. ↑ Happywanderer (2015-11-05). "Historical Timeline of the Abyssinian War". THE ABYSSINIAN CRISIS. Retrieved 2019-01-14. ↑ "Yearbook of the International Law Commission" (PDF). 1978. Retrieved July 22, 2010. p. 184:"... these first incidents, following on that at Walwal, were accidental in character, while the others were for the most part not serious and not at all uncommon in the region in which they took place. In the circumstances, the Commision[ sic ] is of the opinion that there are no grounds for finding any international responsibility for these minor incidents." 1 2 McMahon, Cian. "Eoin O'Duffy's Blueshirts and the Abyssinian crisis". History Ireland. 10 (2): 36. Retrieved 16 November 2017. ↑ Morton, Desmond A Military History of Canada, Toronto: McClelland & Stewart, 1999 p.175. ↑ Kallias, Aristotle Fascist Ideology, London: Routledge, 2000 p.128-129. Two conflicts between Italy and Ethiopia are known as the Italo-Abyssinian War. The following is a timeline relating to the Second Italo–Abyssinian War to the end of 1936. A number of related political and military events followed until 1942, but these have been omitted. The Hoare–Laval Pact was an initially secret December 1935 proposal by British Foreign Secretary Samuel Hoare and French Prime Minister Pierre Laval for ending the Second Italo-Abyssinian War. Italy had wanted to seize the independent nation of Abyssinia (Ethiopia) as part of its Italian Empire and also avenge the 1896 Battle of Adwa, a humiliating defeat. The Pact offered to partition Abyssinia and achieved Italian dictator Benito Mussolini's goal of making the independent nation of Abyssinia into an Italian colony. Emilio De Bono was an Italian General, fascist activist, Marshal, and member of the Fascist Grand Council. De Bono fought in the Italo-Turkish War, World War I, and the Second Italo-Abyssinian War. Walter Alexander Riddell was a Canadian civil servant, diplomat, and academic. He was the Canadian Advisory Officer to the League of Nations from 1924 to 1937. The Ethiopian Empire, also known as Abyssinia, was a kingdom that spanned a geographical area in the current states of Eritrea and Ethiopia. It began with the establishment of the Solomonic dynasty from approximately 1270 and lasted until 1974, when the ruling Solomonic dynasty was overthrown in a coup d'état by the Derg. The Battle of Shire was a battle fought on the northern front of what was known as the Second Italo-Abyssinian War. This battle consisted of attacks and counterattacks by Italian forces under Marshal of Italy Pietro Badoglio and Ethiopian forces under Ras Imru Haile Selassie. This battle was primarily fought in the Shire area of Ethiopia. The Battle of the Ogaden was fought in 1936 in the southern front of the Second Italo-Abyssinian War. The battle consisted of attacks by the Italian forces of General Rodolfo Graziani, the Commander-in-Chief of the forces on the "southern front," against Ethiopian defensive positions commanded by Ras Nasibu Emmanual. The strong defensive positions were designed by Wehib Pasha and known as the "Hindenburg Wall". The battle was primarily fought to the south of Harar and Jijiga. The Italo-Ethiopian Treaty of 1928, also known as the Italo–Ethiopian Treaty of Friendship and Arbitration, was a treaty signed between the Kingdom of Italy and the Ethiopian Empire (Abyssinia) on 2 August 1928. The March of the Iron Will, or the Iron-Will Column, was a Fascist propaganda event staged during the final days of the Second Italo-Ethiopian War. The goal of the march was to capture the Ethiopian capital in a show of force. De Bono's invasion of Abyssinia took place during the opening stages of the Second Italo-Abyssinian War. Italian General Emilio De Bono invaded northern Abyssinia from staging areas in the Italian colony of Eritrea on what was known as the "northern front." The Christmas Offensive took place during the Second Italo-Ethiopian War. The Ethiopian offensive was more of a counteroffensive to an ever slowing Italian offensive which started the war. Tito Minniti was an Italian pilot who was killed after he was captured by Ethiopians during the Second Italo-Abyssinian War in 1935 near Degehabur. His death and alleged torture became an atrocity story justifying the use of mustard gas against the Ethiopians. Minniti was posthumously decorated with the Italian Gold Medal of Valor. Italians of Ethiopia are the immigrants from Italy who moved to live in Ethiopia as far back as the 19th century, and their descendants. King Menelik II did not allow the sale of lands belonging to Ethiopia to Italians (Eritrea) and probably allowed France (Djibouti) to solidify his centralized power and have external trading partners. Most of the Italians moved to Ethiopia after the Italian conquest of Abyssinia in 1936. Italian Ethiopia was made of Harrar, Galla-Sidamo, Amhara and Scioa Governorates in summer 1936 and became a part of the Italian colony Italian East Africa, with capital Addis Abeba and with Victor Emmanuel III proclaiming himself Emperor of Ethiopia.